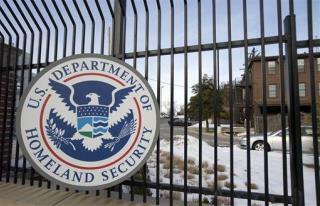 (Newser) – Federal prosecutors are investigating whether a Department of Homeland Security employee with top-secret clearance was planning an attack at the agency's Washington headquarters when he entered the building with a gun, a knife, an infrared camera, pepper spray, and handcuffs. Jonathan Wienke, an analyst in the Office of Intelligence and Analysis, allegedly carried the weapons into the building on the morning of June 9, the AP reports. Court documents filed by the federal government state that investigators have probable cause to believe Wienke "was conspiring with another to commit workplace violence" and "may have been conspiring or planning to commit violence against senior DHS officials in the building." "Placed on leave"?? That'll teach him! "Federal prosecutors are investigating whether a Department of Homeland Security employee with top-secret clearance was planning an attack..." Uhm... it's top secret. Hello? Silly willy. Doesn't he know if he wants to sneak that stuff into such a secure place, all he really needed to do was to send it via Fedex and label it, "Active bio hazard cultures intended for classroom instruction." I mean MASH was almost successful in smuggling in some Adams Ribs by marking it "Medical supplies." Then they left out the cole slaw.